QIP Holder, LLC, doing business as Quiznos, is a franchised fast-food restaurant brand based in Denver, Colorado, that specializes in offering toasted submarine sandwiches. It was founded in 1981 by Jimmy Lambatos and sold to Rick and Richard Schaden ten years later, before growing to nearly 5,000 restaurants afterwards. Quiznos was the second-largest submarine sandwich shop chain in North America, behind Subway. A 2016 survey indicated that Quiznos was the ninth-largest submarine sandwich shop chain based on sales. As of June 2018, however, it was down to about 800 locations. The first Quiznos restaurant was opened in Denver, Colorado, by founder Jimmy Lambatos. At the time, Lambatos was an experienced chef, having previously worked as an executive chef for the Colorado Mine Co. Steakhouse, and having founded the Italian restaurant Footers in 1978. He founded Quiznos with partner Todd Disner in the spring of 1981. The first location was at the corner of 13th and Grant Streets in the Capitol Hill neighborhood of the city. According to Kevin Jenkins, "It was there that recipes for Quiznos special baguette-style bread, special dressings and unique recipes were created." According to Patrick Sweeney, "The sandwich shop earned a following for its toasted subs that Lambatos said were inspired by the oven-baked sandwiches he enjoyed while growing up in New York." Lambatos said of his decision to toast the submarine sandwiches at the first Quiznos that, "it's a signature type of thing. Heating anything brings out the flavors in food products." The restaurant menu featured toasted submarine sandwiches, as well as salads, soups, and desserts. After two years, the restaurant started offering franchises to facilitate expansion offering its first franchises in 1983. The franchises were offered under the name Quiznos American, Inc. By 1987, 12 Quiznos restaurant locations were operating in the United States. That year, Rick Schaden, at the age of 23, and his father, aviation attorney Richard Schaden, opened their first Quiznos franchise in a Boulder, Colorado, shopping center. They opened three additional restaurants before purchasing the 18-restaurant chain from the founders in January 1991 and renamed it the Quiznos Franchise Corp. Rick Schaden became the president, and then CEO, of Quiznos after the purchase. Jenkins wrote that Schaden, "began building a professional infrastructure to support franchise owners that included volume purchasing, standardized training, and operations procedures, as well as marketing support." Quiznos was taken public in February 1994, with an initial public offering of one million shares of stock at $5 per share, resulting in a $4.4 million yield. By the end of 1995, Quiznos had 103 different locations. In 1997, Quiznos became the number-three submarine sandwich franchise in the world, with 278 locations in the U.S. and Puerto Rico. The following year, Quiznos Canada acquired the master franchise rights to Quiznos restaurants in Canada, as well as the master rights in the United Kingdom in 1999. Glenvista Enterprises then acquired the rights for several states in Australia. KMN USA LLC acquired the franchise rights for Japan, opening its first location in early 1999. The company again went private in June 2001. In 2002, Wendy's acquired the rights to the brand for franchises in Australia, and later, New Zealand, but was unsuccessful in launching the chain in either country. The first location in Mexico opened in Monterrey in 2002. In 2005, the company partnered with Ray Wilson to open a new chain of fitness clubs called 123 Fit. At its peak in 2007, there were more than 5,000 Quiznos franchise locations. The first location in Canada (and outside of the United States) opened in Vancouver in 1996. The first European location opened in 2001 in Peterborough in the United Kingdom. The first location in India opened in Hyderabad in 2011, followed by the first location in the Philippines opened in 2012. In 2013, Quiznos opened its first two locations in Russia during the same weekend in St. Petersburg. Quiznos opened its first Taiwan location in Taipei and also its first United Arab Emirates location in Abu Dhabi in September 2014. Between 2007 and 2009, 1,000 Quiznos stores in the United States closed. After the closure of around 2,000 restaurants during the Great Recession, a majority stake in the company was purchased by Avenue Capital Group of New York in January 2012. According to Ed Sealover, the purchase was done in "a deal that eliminated about one-third of the company's $900 million debt and infused about $150 million cash into the company." Avenue Capital Group brought on turnaround specialist Harsha V. Agadi as Quiznos executive chairman. They also brought on Stuart Mathis as CEO; the former president of The UPS Store stated that the company would try to counteract shrinking sales by promoting "the quality of its food." On March 14, 2014, Quiznos filed for Chapter 11 bankruptcy in the United States Bankruptcy Court for the District of Colorado. Quiznos said it would continue operating while it restructured its debt and made operational improvements. Quiznos emerged from bankruptcy about four months later on June 30, 2014, and reduced its debt by approximately $400 million. On June 11, 2018, Quiznos announced that it was acquired by California-based High Bluff Capital Partners. The chain will retain its headquarters in Denver. As of 2015 there are now fewer than 1,000 Quiznos restaurants in the United States. The chain also said it planned to expand to locations in over 40 countries and territories, including Europe, the Middle East, Southeast Asia and Central and South America, by 2012. In July 2013, the company stated it planned to expand into Russia, where it is looking to open about 500 stores. QSR wrote in November 2013 that, "Following its most recent international successes in Mexico, Russia, and the United Arab Emirates, Quiznos will bring toasted sandwiches to Indonesia with the signature of PT Quiznosindo as the brand's newest franchisor. The group, led by Tan Po Lian, plans to open 100 units in Indonesia over the next 10 years. Quiznos South Korea has seen a system wide 12 percent sales lift, largely due to a country-wide marketing campaign, featuring actor Lee Sang Yoon, launched in March 2013. Expansion into Pakistan, Singapore, South Korea, the Philippines, and Indonesia is part of Quiznos' continued international development plan to open more than 1,000 international stores in more than 40 countries by 2020." The company's first major advertising push was a successful advertising campaign during the 2002 Super Bowl. Early TV spots advertised the innovation of toasting sandwiches, as compared to the inventor of pants (humorously contrasted with men wearing bushes). One commercial in 2003 depicted a man (a then-unknown Jim Parsons) who had been "raised by wolves" by suckling at a mother wolf's teat. Other promotions include an early 2004 campaign featuring bizarre, rodent-like, singing creatures called Spongmonkeys, as well as a series of Quiznos commercials in Canada featuring hockey commentator Don Cherry. In 2005, Quiznos launched a campaign featuring Baby Bob. In June 2006, Quiznos revealed its new slogan: "Eat Up." Ads nationwide feature a Quiznos sub with steam emanating from it with the tagline, "Mmmm... toasty." Actor Michael Clarke Duncan formerly provided the voiceover for all Quiznos commercials. On September 18, 2006, Quiznos launched the most aggressive advertising campaign aimed at Subway. Dubbed the "Prime Rib Cheesesteak Challenge," customers were asked to compare the brand new Prime Rib Cheesesteak against Subway's Cheesesteak sandwich. The claim is that the Prime Rib Cheesesteak has twice the meat of Subway's Cheesesteak. If the customers are not satisfied, then they can fill out a form, mail the form along with their receipt, and they will receive a coupon for a free sandwich. In subsequent advertisements, Quiznos was shown competing with the fictional "Wrong Way" restaurant based on competing restaurants. The Coca-Cola Company was originally the primary soft drink supplier for the franchise, until 2005. At that time, Coca-Cola signed an exclusive agreement to provide soft drinks to the competing Subway franchise. As a result, Quiznos signed an exclusive deal with PepsiCo (except in Canada and on college campuses that have exclusive deals with Coca-Cola) and Dr Pepper Snapple Group (to serve Dr Pepper). In 2016, company partnered launched their mobile based loyalty program. This app was aimed at rewarding Quiznos' most loyal customers and to gather customer feedback to improve product and operations. Quiznos has been the target of several lawsuits related to its treatment of franchisees, including lawsuits in New Jersey and Wisconsin. It has faced more lawsuits from franchisees than bigger chains, such as McDonald's, Burger King, Wendy's, and even its sandwich competitors Subway and Blimpie, according to an analysis by the legal research firm Thomson West. In February 2007, Quiznos franchisees filed a lawsuit seeking class-action status in Michigan. One lawsuit (filed in New Jersey and seeking class-action status) said that the astounding growth record of Quiznos was merely a mirage. In 2003 and 2004, Quiznos said it sold 234 "trade areas" in the state of New Jersey to franchisees, collecting the $25,000 franchisee fee, but none of these locations ever opened, according to the lawsuit. Three years after handing over her check for the fee, Elisa Whitehall said that she had yet to open a Quiznos in the location she bought and that Quiznos refused to return the fee. One lawsuit cited a memorandum drafted by a Quiznos lawyer in 2003 that stated, "40 percent of Quiznos units are not breaking even," a fact that prospective franchisees say they were never told. The Small Business Administration said 23.4 percent of Quiznos franchises with SBA loans failed. In contrast, Subway had a 4.8 percent failure rate. As a single example of an unprofitable franchise, Fredrick N. Westerfield was running three Quiznos in Wisconsin. After spending $14,000 in personal savings to keep the stores running, he realized he had a debt of $750,000. He closed all his stores in 2005. "Customers used to come into the store and say to me, 'You must be rolling in the money,'" recalled Mr. Westerfield. "If they only knew." In 2002, the Seattle Times reported that the company initially ignored the plight of a Quiznos employee who took over operations of one Quiznos store after the true owner abandoned it. Months later, the store was closed. In June 2004, the Quiznos at Downtown Crossing, Boston, was at the center of a hepatitis scare. In 2006, Quiznos sent letters to 300 franchises saying mystery shoppers would be coming to test their services. The company sued franchise owners Richard Piotrowski and Ellen Blickman for not putting enough meat in a prime rib sandwich. Piotrowski and Blickman countersued and won the lawsuit in 2009. Judge Morris Hoffman called the meat-weighing exercise and subsequent termination letters a "charade" aimed at bolstering a national ad campaign against rival Subway. On November 27, 2006, Bhupinder Baber, franchise owner of two Long Beach, California, Quiznos locations, committed suicide after a legal battle with the company. In his suicide note, Baber attributed mistreatment by Quiznos to driving him to suicide. The Toasted Subs Franchisee Association (TSFA), a group of franchisees, posted Baber's suicide note on its website, and intended to raise money for Baber's family. Quiznos attempted to terminate the TSFA's franchises. The TSFA in turn filed an injunction on December 15, 2006, in the District Court of Colorado. A 2014 article in the Long Beach Post suggested that the factors that contributed to Baber's suicide also led to the parent company's bankruptcy in 2014. On September 9, 2007, a gay bashing occurred in the Towers West Quiznos on the campus of Vanderbilt University in Nashville, Tennessee. A student, Robert Gutierrez, and a non-student hurled homophobic slurs at two gay students while assaulting one. A report was filed with the Vanderbilt University Police Department, and Gutteriez was reportedly suspended. On December 1, 2015, Quiznos opened a concept restaurant called Quiznos Grill hoping to re-brand its products and increase menu offerings. Initial reviews of this restaurant highlighted the high price (~$20 USD) once items were added to the sandwich (vegetables, cheese, etc.) or meal (chips, drinks, etc.). In late 2016, the Quiznos Grill concept was abandoned and relaunched as Zeps Epiq Sandwiches. Some of the Quiznos Grill sandwiches remained on the menu, while vegetarian choices, salads, all-day breakfasts, and loaded tater tots were added. In 2004, Quiznos started using the bizarre, fuzzy looking creatures called the Spongmonkeys (which were designed by Joel Veitch) in their advertising commercials. One of them plays a guitar, and the other sings a song called "We Love the Subs", in an apparent and shorter spoof of their original song, "We Like the Moon". Several commercials with the Spongmonkeys were released, including ones about rejoice and coupons. However, after a few months, Quiznos discontinued airing these commercials. An inflatable character costume that is in the style of a plastic Quiznos cup is used in and around the store. ^ Jargon, Julie (December 6, 2013). "Crisis Quickens at Quiznos". Wall Street Journal. Retrieved April 21, 2015. ^ Restaurant Business Staff (June 21, 2016). "2016 Top 500: Sandwich Chains". Restaurant Business Online. Retrieved December 9, 2018. ^ Rubino, Joe. "California company buys Quiznos, but Denver-born sandwich chain to keep its HQ local, new owner says". Denver Post. Retrieved January 19, 2019. ^ a b Jenkins, Kevin (September 12, 2002). "Quizno's fills niche between fast, fine dining". Southeast Missourian. Retrieved October 31, 2013. ^ Sweeney, Patrick (February 16, 2003). "Briefs spot puts Quiznos founder in the public eye". Denver Business Journal. Retrieved October 31, 2013. ^ Smith, Andrew F. (2011). Fast Food and Junk Food: An Encyclopedia of What We Love to Eat, Volume 1. ABC-CLIO. p. 586. ISBN 9780313393938. Retrieved November 6, 2013. ^ Smith, Andrew F. (2006). Encyclopedia of Junk Food and Fast Food. Greenwood Publishing Group. p. 225. ISBN 9780313335273. Retrieved November 6, 2013. ^ Wagner, Kyle (February 20, 2004). "System not a go at all Quiznos". Denver Post. pp. FF-09. (Subscription required (help)). Cite uses deprecated parameter |subscription= (help) Alternate Link via ProQuest. ^ Gartner, William B. & Bellamy, Marlene G. (2008). Creating the Enterprise. Cengage Learning. p. 354. ISBN 9780324353631. Retrieved November 4, 2013. ^ The Philip Lief Group & Arden, Lynie (2010). 220 Best Franchises to Buy: The Essential Sourcebook for Evaluating the Best Franchise Opportunities. Random House. ISBN 9780307432117. Retrieved October 28, 2013. ^ a b "Quiznos launches health club chain". Denver Business Journal. February 10, 2005. Retrieved October 31, 2013. ^ a b "The Quizno's Corporation: Company Profile, Information, Business Description, History, Background Information on The Quizno's Corporation". Reference for Business. Retrieved October 31, 2013. ^ Switzer, Peter (August 31, 2007). "Bitter lesson in Quizno's affair". The Australian. ^ "Quizno's opens first Mexican restaurant". Denver Business Journal. November 7, 2002. ^ Munk, Nina (2013). The Idealist: Jeffrey Sachs and the Quest to End Poverty. Random House. ISBN 9780385537742. Retrieved October 31, 2013. ^ a b Sealover, Ed (May 18, 2012). "Quiznos strives to be 'Better Than Ever'". Denver Business Journal. Retrieved October 31, 2013. ^ "Quiznos sees Quebec restaurant break national first week sales record". Canada NewsWire (Press release). August 5, 2008. ^ "Quizno's begins European launch with UK openings". Market Magazine. March 11, 2001. ^ Raje, Abhishek (December 9, 2011). "Quiznos opens first store in India". Times of India. ^ "Quiznos to open first PH restaurant next week". ABS-CBN. September 19, 2012. ^ Pankratz, Howard (July 26, 2013). "Denver-based Quiznos opens in Russia, plans 500 restaurants there". Denver Post. ^ "Quiznos brings toasted subs to Taipei with trial run". China Times. September 3, 2014. Archived from the original on October 18, 2014. Retrieved October 14, 2014. ^ "Taiwan Business Briefs: Quiznos to open 100 stores". Taipei Times. September 15, 2014. p. 14. ^ "Quiznos targets 100 Taiwan stores". Inside Retail Asia. September 15, 2014. ^ "Quiznos opens first outlet in the UAE". Gulf Today. September 28, 2014. ^ "Quiznos opens first outlet in UAE; seven more this year". Khaleej Times. September 27, 2014. ^ a b Trowbridge, Denise (July 13, 2010). "Quiznos activates strategy to bounce back". Columbus Dispatch. Archived from the original on July 22, 2010. Retrieved August 1, 2010. ^ "Struggling Quiznos sandwich chain working with creditors on debt restructuring". Denver Post. December 21, 2011. ^ Harden, Mark (February 21, 2012). "Quiznos names executive chairman, board members; CEO will stay on". Denver Business Journal. Retrieved November 6, 2013. ^ Jennings, Lisa (October 16, 2012). "Quiznos CEO outlines strategies, moves ahead". Nation's Restaurant News. Retrieved November 6, 2013. ^ Palank, Jacqueline (March 14, 2014). "Quiznos Files for Chapter 11 Bankruptcy Protection -- 2nd Update". Wall Street Journal. Retrieved March 14, 2014. ^ McCarty, Dawn & Patton, Leslie (March 15, 2014). "Quiznos Follows Sbarro Into Bankruptcy Court". Bloomberg News. Retrieved October 30, 2014. ^ "Quiznos Emerges from Bankruptcy". Associated Press. July 1, 2014. Retrieved August 20, 2014. ^ Rubino, Joe (June 12, 2018). "California company buys Quiznos, but Denver-born sandwich chain to keep its HQ local, new owner says". The Denver Post. Retrieved June 18, 2018. ^ Strauss, Karsten (June 17, 2015). "Is Quiznos Toast?". Forbes. ^ "Quiznos planning to open shops in Kuwait". Associated Press. November 2, 2010. ^ "Quiznos Thrives in Asian Markets". QSR. November 20, 2013. Retrieved December 12, 2013. ^ McCarthy, Michael (April 30, 2002). "Quizno's doesn't hold back in ads". USA Today. Retrieved October 31, 2013. ^ Swartz, Mimi (December 12, 2011). "Jim Parsons is my Texan of the Year". Dallas News. Retrieved October 31, 2013. ^ Stevenson, Seth (February 23, 2004). "The Creatures From the Sandwich Shop". Slate. Retrieved October 5, 2012. ^ Zelkovich, Chris (September 6, 2004). "Burke's bites a relief from Cherry flavour". Toronto Star. Retrieved October 31, 2013. ^ "The Insider: Baby Bob lands on his feet with Quiznos gig". Seattle Post-Intelligencer. January 16, 2005. Retrieved October 31, 2013. ^ Kiefaber, David (April 1, 2011). "Dipping Quiznos sandwiches isn't this hard". Ad Week. Archived from the original on August 7, 2013. Retrieved October 31, 2013. ^ Hoffman, Ken (January 12, 2006). "Quiznos bread bowls good to the last crumb". Houston Chronicle. Retrieved October 31, 2013. ^ Shore, Sandy (January 28, 2008). "Redefining Quiznos". Fort Wayne Journal Gazette. Archived from the original on April 22, 2014. Retrieved October 31, 2013. ^ "Quiznos Launches New Double Cheese Cheesesteak Sub with "Beefed" Up". Duluth News Tribune. October 29, 2009. Archived from the original on December 12, 2013. Retrieved October 31, 2013. ^ "Quiznos launches aggressive ad campaign against rival Subway". Herald-Journal. October 1, 2006. p. E6. Retrieved October 31, 2013. ^ "Quiznos intros Peppercorn Parmesan Turkey sandwich". Fast Casual. April 16, 2007. Archived from the original on December 13, 2013. Retrieved October 31, 2013. ^ "Quiznos makes switch from Coca-Cola to Pepsi". Deseret News. Associated Press. August 29, 2004. ^ "Quiznos Debuts Toasty Points Loyalty App". Hospitalitytech.com. October 4, 2016. ^ a b c d e f Creswell, Julie (February 24, 2007). "When Disillusion Sets In". New York Times. Retrieved August 1, 2010. ^ Hulsey, Lynn & McCall, Ken (April 6, 2013). "Taxpayers paid $1.3B to cover bad business loans". Dayton Daily News. Retrieved October 30, 2013. ^ Holt, Shirleen (February 4, 2005). "Fast-food shop owner takes off, employees take over". Seattle Times. Retrieved June 28, 2011. ^ Holt, Shirleen (March 24, 2005). "Manager who never quit sees Quiznos store shut". Seattle Times. Retrieved June 28, 2011. ^ "Hundreds Show Up For Quiznos Hepatitis Clinic". WCVB-TV – The Boston Channel. June 29, 2004. Archived from the original on September 30, 2007. Retrieved January 6, 2007. ^ "Quiznos v. Zig Zag Restaurant Group". Scribd. December 31, 2008. Retrieved June 28, 2011. ^ McGaw, Renee (January 9, 2009). "Quiznos loses case over treatment of franchisee". Denver Business Journal. Retrieved August 1, 2010. ^ Tice, Carol (July 2, 2010). "As Lawsuit Settlement Nears, Quiznos and Franchise Owners Need to Hug it Out". CBS MoneyWatch. Retrieved June 28, 2011. ^ Liddle, Alan J. (July 2, 2010). "Quiznos class-action case close to settlement". Nation's Restaurant News. Retrieved June 28, 2011. ^ Arellano, Kristi (December 15, 2006). "Quiznos fires 8 franchisees". Denver Post. ^ Baber, Bob. "Bob Baber Suicide note" (PDF). MediaNews Group. ^ "Disenfranchised: Why Are Americans Still Buying Into the Franchise Dream?". Pacific Standard. March/April. 2014. Retrieved July 23, 2016. ^ "Quiznos franchisees fight back". Fast Casual. Networld Media Group. December 14, 2006. Archived from the original on July 23, 2015. Retrieved July 23, 2016. ^ Bennett, Sarah (March 28, 2014). "Quiznos Bankruptcy May Have Roots in Long Beach Franchisee's Suicide". Long Beach Post. ^ a b Towle, Andy (September 17, 2007). "Gay Students Assaulted in Anti-Gay Hate Crime at Vanderbilt". Towleroad. Retrieved June 5, 2018. ^ Jones, Jerry (September 20, 2007). "Vanderbilt student involved in alleged anti-gay assault says punishment 'too harsh'". Out & About. Retrieved June 5, 2018. ^ Jennings, Lisa (December 2, 2015). "New Quiznos Grill concept debuts as part of turnaround plan". Nation's Restaurant News. ^ "Quiznos Grill Switches to Zeps Epiq Sandwiches". Westword. Retrieved October 20, 2017. 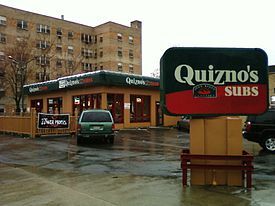 Wikimedia Commons has media related to Quiznos. This page was last edited on 24 April 2019, at 21:34 (UTC).